The Galaxy S10+ is the culmination of a decade of S series innovation—a powerful phone that helps you work for longer, wherever your business takes you. The large curved-edge Infinity-O Display helps you focus on work, multi-tasking and editing documents with ease. The powerful battery keeps you going when it matters most. And with 5 cameras, including an ultra-wide angle lens, you can capture documents, presentations and designs in full detail. Get more done with a bigger display. Editing complex documents on the move is tricky with a small mobile screen. That’s no problem with the Galaxy S10+. The large, curved-edge display has no home button or notch for the receiver, giving you an uninterrupted viewing experience. Share your power. Use Wireless PowerShare on the Galaxy S10+ and bring a colleague’s drained phone back to life. Or top up your Galaxy Buds when you’re on the move (1). So, if you’re out of the office, or travelling for business, you can leave the cables at home. (1) Wireless charge compatible (QI standard) devices only. Battery charge above 30% required to PowerShare on the move without being plugged into mains charge. 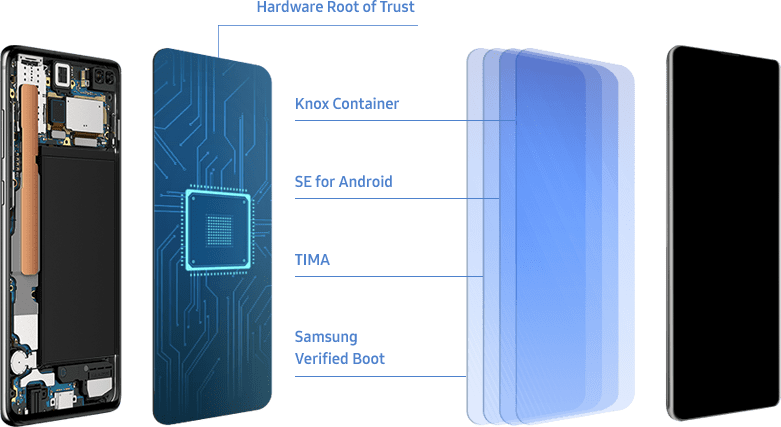 The Galaxy S10+ is protected by Samsung Knox, our defence-grade security platform built from the chip up. No matter where you go or what you do, you can be sure your business’ data stays secure with superior protection that’s easy to manage. Enjoy Samsung DeX by directly connecting the Galaxy S10+ to a monitor with a single cable for a PC-like experience (1). Access a world of apps and documents optimised to let you work like you do on a PC, and even use every feature of the Galaxy S10+ while you’re connected to the big screen. (1) USB-C to HDMI cable and accessories sold separately. Access the largest range of business apps available in the Android store, plus a range of preinstalled Samsung business apps. You also get Microsoft Office 365 preinstalled, letting you view documents straight out of the box (1). So, whether you’re on the move or away from your desk, work doesn’t have to stop. (1) Microsoft Office 365 licences sold separately. Take the bigger picture. Boasting 5 cameras, including an a-wide angle lens, the Galaxy S10+ lets you capture the world as you see it. Take photos of documents, notes or presentations at meetings. Then share them instantly with colleagues at the office. Or if you’re on location, your shots won’t miss a single detail – even if it’s dark.